Dove Rock has as fine a coastal location as you could imagine, and architecture which makes the most of it in every conceivable way. You won’t find any greater lovers of traditional country house architecture than us at Country Life. Sometimes, though, a house comes along with a far more modern style which fills us with joy about the possibilities opened up by modern techniques. It’s one such house that we look at here: Dove Rock, in a Cornish village called Plaidy, near East Looe. 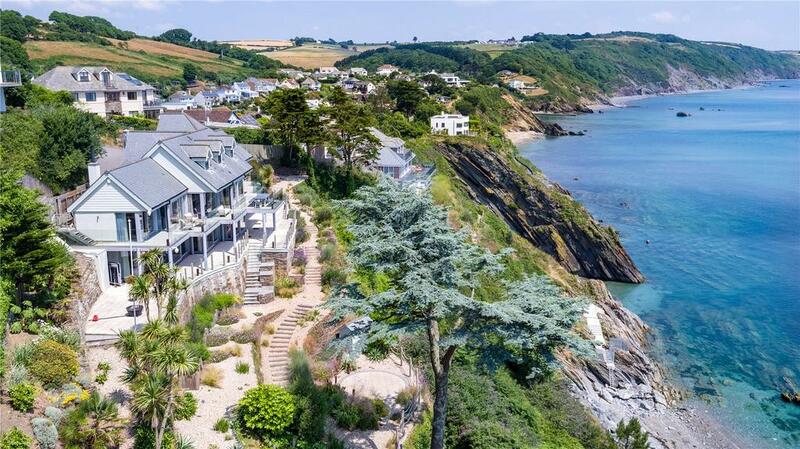 This 3,905sq ft house, which has just come to the market with Jackson-Stops at an asking price of £2.5 million, has as fine a coastal location as you could imagine – and architecture which makes the most of it in every conceivable way. 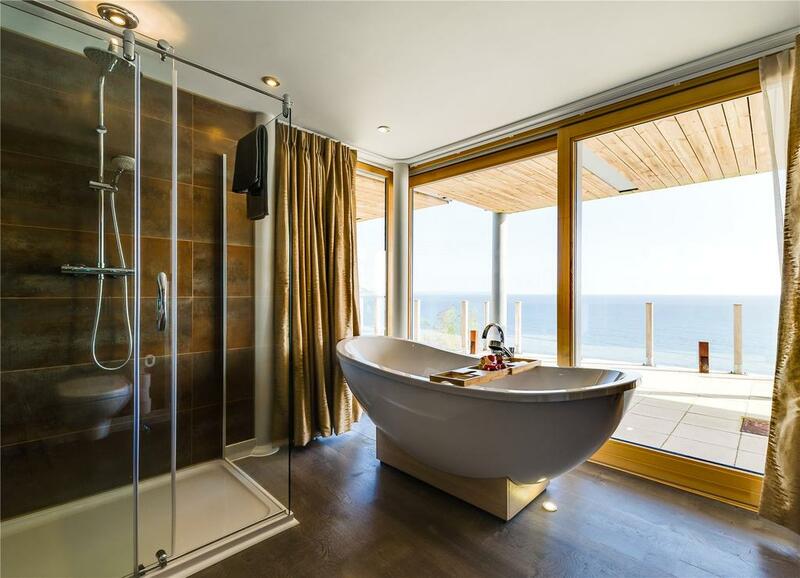 The entire house is arranged in order that almost every single room enjoys the sweeping views across the English Channel from floor-to-ceiling windows that span the entire length of the property. 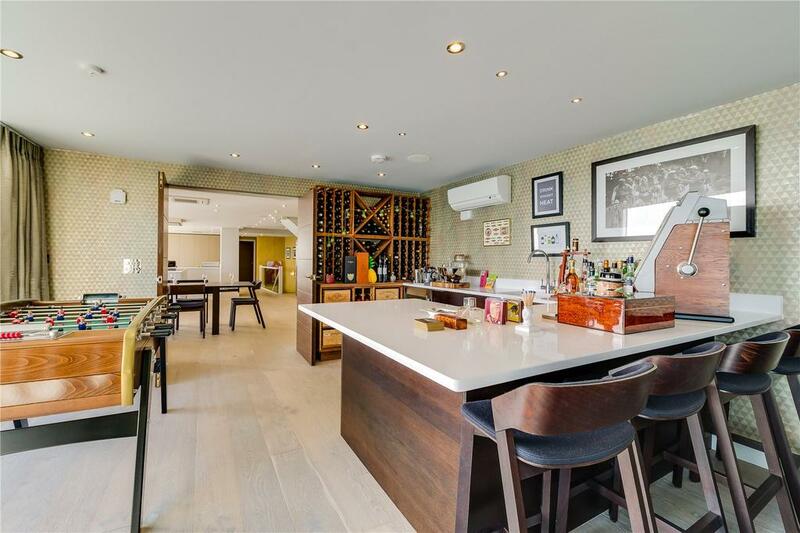 The centrepiece of the house is the open plan kitchen dining room, with a huge kitchen island and dining table dominating the space. Off to one side is a living room that’s part sitting room, part games room and part bar; to the other side is a library, complete with log burner for giving some warmth and cosiness in the colder, wetter months. The whole place is currently decorated in a style with period touches which give it the feel of an old James Bond movie. You’d half expect to find Roger Moore sitting in the library, with a vodka martini in one hand and a Walther PPK in the other. That’s as old school as things get, however; the list of features include modern touches such as under floor heating and wireless Sonos sound system throughout. The five bedrooms are split between first floor and lower ground floor, all of them en-suite (the bathrooms get views as well), and two of them on the lower floor sharing access to a separate sun room. The house has just over an acre and a half of landscaped gardens, though as you’ll see from the pictures on this page this isn’t a house for somebody who loves keeping a nice, big lawn. 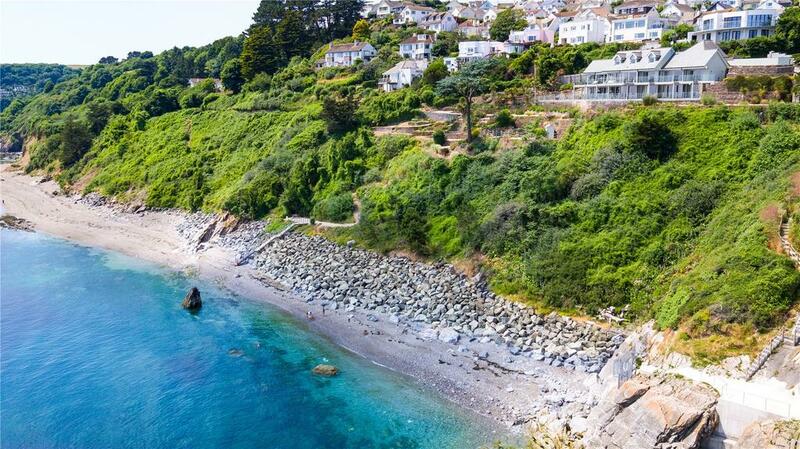 Instead, the outside playing area is on the beach, accessed directly via a set of steps, and a large chunk of which is actually owned by Dove Rock; all in all the sale includes a total of 21 acres of magnificent Cornish coast. It would be a great holiday let, of course, but would also make a wonderful family home – there’s a primary school within walking distance, for starters. It’d be lovely to think of a some lucky children enjoying the privilege of growing up in such a beautiful spot. 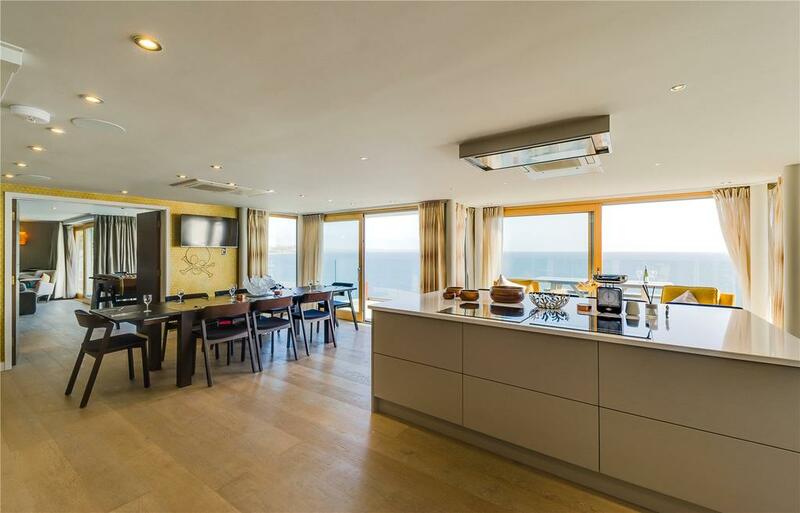 Dove Rock is on the market with Jackson-Stops at an asking price of £2.5 million – see more details and pictures.